Being able to trust in and feel comfortable with your dentist is one of the most important elements in maintaining proper dental wellbeing. When it comes to more serious dental work, such as the placing of dental implants and conducting total smile makeovers, you need to feel confident in your dentist’s abilities to get the job done successfully. There are many crucial qualifications that separate a good implant dentist from a great one, that’s why it’s so important to know what to look for when selecting an implant dentist. One of the most important things to look for when selecting an implant dentist are their accreditations, a truly skilled and qualified implant dentist will have many to their name. The best implant dentists are ones who publish multiple studies and articles in trusted dental and medical journals, giving them a better depth of knowledge on all things related to dental implants. More than anything, it’s important to look for an implant dentist who is recognized in their field for the quality and breadth of their work. Dr. Michael Tischler is one of the most talented and renowned leaders in the field of implant dentistry, and has changed the lives of thousands of people across New York State! When it comes to accreditations, Dr. Michael Tischler possesses the best of the best as a Diplomat of both the American Board of Oral Implantology/Implant Dentistry (one of only 500 worldwide) and International College of Oral Implantologists, on top of being a Fellow of the American Academy of Implant Dentistry and the Misch International Implant Institute. Dr. Tischler has also published over 40 articles on implant dentistry and bone grafting. He has brought his passion and vast experience for dental implants into not only his private practice, but also his revolutionary dental implant treatment franchise – Teeth Tomorrow®! Dr. Tischler created the Teeth Tomorrow® Prettau® Zirconia full-arch dental implant bridge to be the only truly permanent solution to missing and failing teeth. Having seen firsthand how other dental treatments were so prone to failure, he was able to use his extensive knowledge to create a working solution, backed by an over 99% success rate! 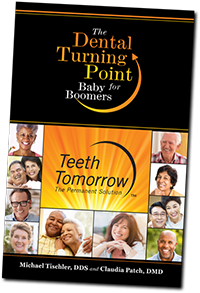 If you find yourself fed up with all the “quick-fix” solutions, then you need Teeth Tomorrow®! Contact the team at Teeth Tomorrow® Hudson Valley today for a brighter tomorrow!